When I worked as a journalist in a busy BBC newsroom, we used to have something called the emergency tape. It was a programme that we could put on the air in case of an emergency, for example if we needed to evacuate the studios because of a fire alarm, flood etc. It was rarely ever used. But it was a real lifeline if we needed it. 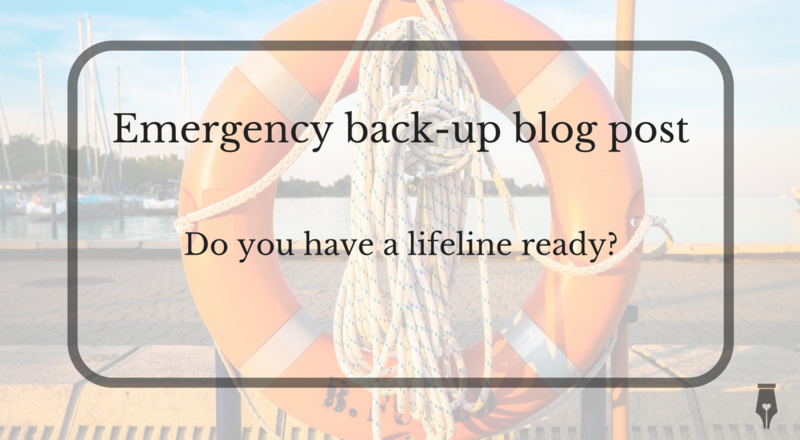 I was talking about the idea of emergency back-up content earlier this week. And wouldn’t you know it, I could have really done with a blog post ready and waiting in reserve. I always schedule time in my calendar to write, edit and create images for my blog posts. But this week that time was demanded on another project, and then a family emergency meant I really had nowhere else to schedule it. When I set myself the challenge of writing a blog post every week for a year (on top of my regular writing work) I had a few emergency blog posts banked up in reserve. That meant that if I was travelling, or working away; if I felt sick or an important event clashed with my dedicated blogging time, I had a back up to rely on. I didn’t use all of those back-up blogs that year, but they haven’t gone to waste, as I used them to create content for my website and inspire content that I now use in my freelance writing, training and brand storytelling business. As a BBC radio and television reporter, I also had a bank of ‘rainy day/anytime stories’. These were ideas that I could pick up on a slow news day and turn into a radio or television package. I’ve applied the same strategy to regular writing tasks in my time. When one idea has lead to another, or when I’ve got more research and information than fits the word count for that task, I’ve filed it away to come back to when I needed it. Do you have back-up content ready to go? This has become my emergency blog post. Hastily pulled together when I’ve had ten minutes or so while travelling. What I’ve learned this week is to make full use of that valuable newsroom training. To go back to the discipline of making sure that I do have content ready to publish quickly if I need to. Is that a strategy you could use in your business too? What do you do when you’re short of time? Out of contact? Or if you just need some business content in a hurry. As they say in broadcasting, normal service will resume as soon as possible.